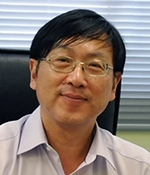 Ng Tai Kai | People | HKUST Department of Physics "; myhtml += "
Graduated from HKU (Undergraduate) and Northwestern University (PhD), I am a theoretical condensed matter physics interested at application of Quantum Field Theory to condensed matter systems. Topics of research interests include strong correlated electrons and spin-liquid states, non-equilibrium mesoscopic transports, topological order and unconventional superconductors. Since 2000/2002, I am a Fellow of the American Physical Society (2000) and a Croucher Senior Research Fellow (2002). I am also deeply involved in promoting Science education and education for the gifted learners. I am a member of CDC Committee on Science Education, CDC since 2002 and a member of CDC Committee on Gifted Education, CDC since 2012. At present I am a Co-Editor of Europhysics Letters and a Council Member of the Hong Kong Institute of Education (HKIEd). I am taking a no-pay leave from my professorship to be the Executive Director of the Hong Kong Academy of Gifted Education starting June 1st, 2014. “Renormalization Group Approach to Anderson Impurity in the Bulk of TopologicalInsulators”, Igor Kuzmenko, Yshai Avishai and Tai Kai Ng, Phys. Rev. B 89, 035125 (2014). “Broken time-reversal symmetry in Josephson junction involving two-ban superconductors”, Tai-Kai Ng and N. Nagaosa, EuroPhys. Lett.87, 17003 (2009). “Majorana Fermion induced Resant Andreev Reflection”, K. T. Law, P. A. Lee and T. K. Ng, Phys. Rev. Lett. 103, 237001 (2009). “Power-law Conductivity inside the Mott gap: application to -(BEDT-TTF)2Cu2(CN)3”, T. K. Ng and P. A. Lee, Phys. Rev. Lett.99, 156402 (2007). “On-site Coulomb repulsion and resonant tunneling”, T. K. Ng and P. A. Lee, Phys. Rev Lett. 61, 1768(1988). “Spontaneous Vortex Phase observed?” T. K. Ng and C. M. Varma, Phys. Rev. Lett. 78, 330(1997). “Edge states in antiferromagnetic quantum spin chains”, T. K. Ng, Phys. Rev. B50, 555(1994).